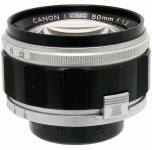 This lens was developed by further improvement and research on the world-famed 50mm F1.8. All the latter's fine features were incorporated. Unique lens design, developed by the Canon engineering staff made possible the highest quality 6-element F1.4 which gives a non-flare picture of edge-to-edge sharpness even at full aperture.